You've probably heard the Malcolm Gladwell spiel about Canadian hockey players—namely, that a massive number of them are born in January. As it turns out, this isn't just a hockey thing. 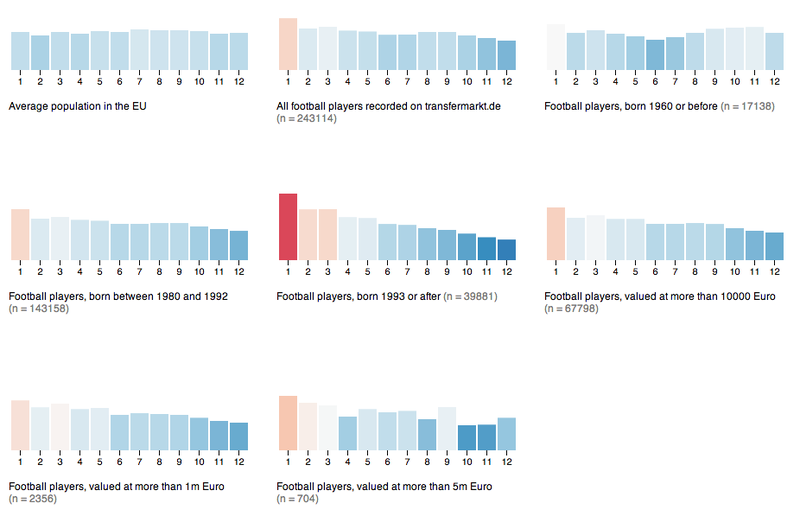 Scraping birthdays from transfermarkt.de, David Bauer has found a very similar effect among professional soccer players, displayed in the charts above. As Gladwell noted in Outliers, a disproportionate number of top Canadian hockey players are born towards the beginning of the year. * From 1980 to 2007, 36 percent of NHL draftees were born in January, February, or March, while just 14.5 percent were born in October, November, or December. The explanation may be simple: Players are placed into junior leagues based on a January 1st age cutoff, so—at young ages—the earlier birthdays have a distinct age/size/coordination advantage that snowballs into more coaching attention and better play. It appears that this may happen in pro soccer as well. Across all 243,114 players in the database, 29.9 percent were born in the first three months of the year, compared to 21.1 percent born in the last three months. Among very young players—born 1993 or later—the effect is almost exactly in line with the NHL, with 36.9 percent of birthdays coming in the first three months of the year, and just 15.3 percent coming in the last three. *This effect may diminish at the very top level of play. Back in 2012, Jon Levey observed that younger Canadian players were higher-paid in the NHL and more likely to make the Olympic team.